So we have an intimate connection with God- but we hold that in tension with God who “is in heaven.” The God who is in heaven is a Holy God. The God who is in heaven is unlike our earthly fathers, regardless of how great or terrible they are. While the prayer has it’s foundation on a personal relationship with God- it is balanced with a reverent and awe-filled view of God’s holiness. This view of God brings us to our knees because our sinfulness cannot stand in the presence of the Holiness of God. Like Isaiah (Isa 6), when we come into the presence of the Holy God, we are undone and recognize our sinfulness, our brokenness, and the need for grace. The Lord’s Prayer as a model reminds us of the priority of our prayers- we are to praise God for who God is first and foremost. Yes, we may pray out of crisis, need, or want- but we must not forget WHO we pray to. The Lord’s prayer reminds us that we can go to God in our times of need like we would go to our earthly father- and that our “Heavenly Father” is much bigger than the circumstances in our lives. 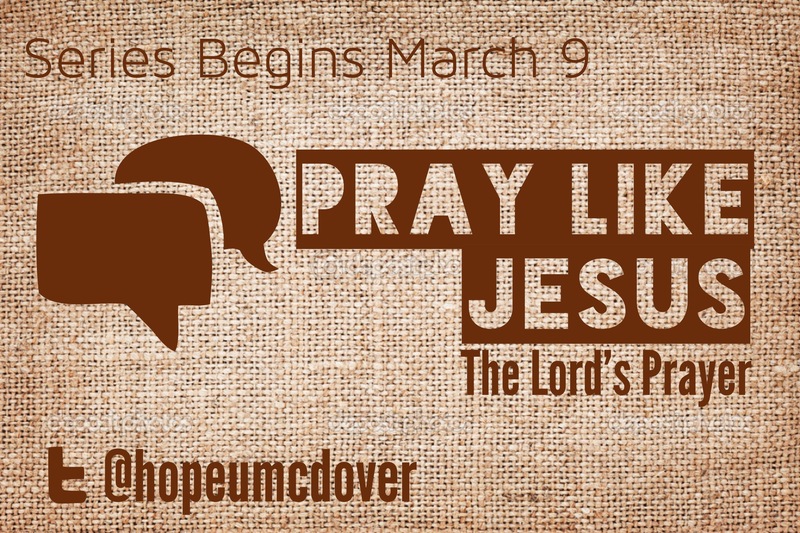 This entry was posted in Hope Church, Sermons, Uncategorized and tagged Lent, Lord's Prayer, Pray Like Jesus, Prayer, Sermon. Bookmark the permalink. Interesting to note that Jesus would not have prayed this prayer himself: he didn’t need to. He had never sinned, so he didn’t need to ask forgiveness. That’s correct- The Lord’s Prayer is a template for believers to use in their own prayer life. Jesus offered it as a teaching moment to provide structure and guidance in their prayer time. Thanks for reading and commenting, Philip!